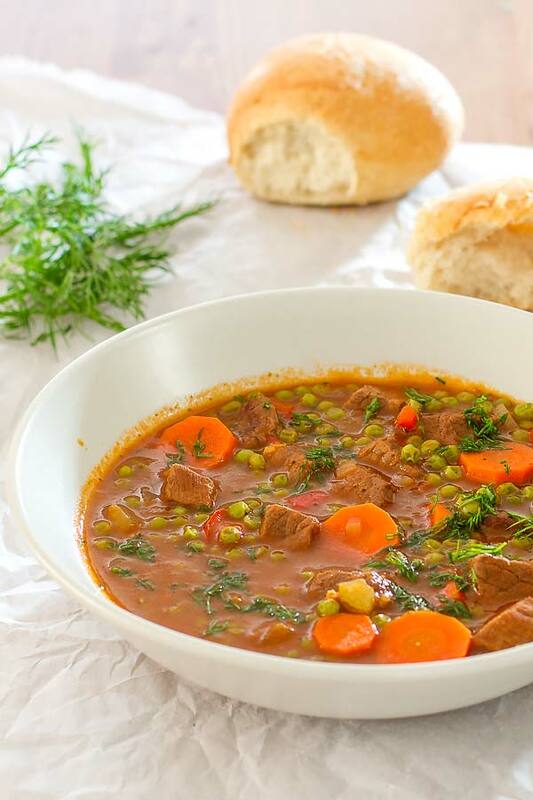 My latest Romanian recipe is pretty much a classic, my mother used to make it quite often when I was little… and when I was grown up too but I never stopped loving it. She used to make it with chicken drumsticks/legs but now I wanted to try something else so I used beef, eye of round to be exact. Now this meat is pretty gummy usually, or at least from my experience, but if you follow my instructions it would become very tender and delicious. As I said, eye of round is weird as far as I’m concerned, heck beef is weird to begin with, unless you have a AAA steak, but I wanted this because it seems to have the least amount of fat and I kinda like that in my stew. 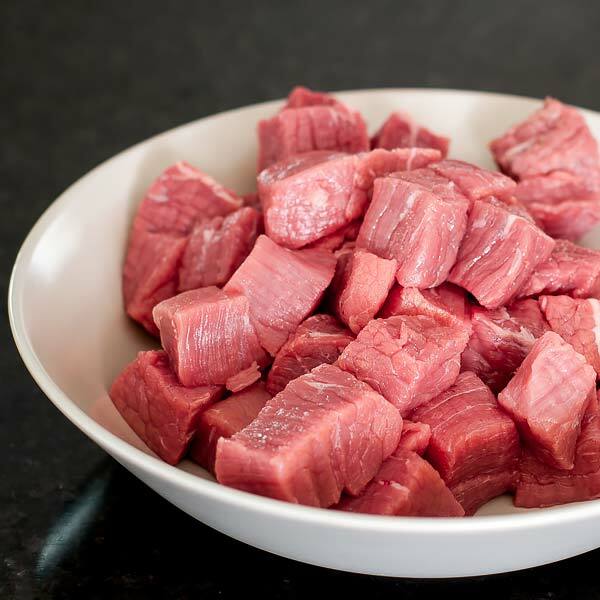 Anyway, cooking the meat is pretty easy, but time consuming, just cut it into pieces and place it in a deep skillet with some butter or vegetable oil on medium heat. Make sure you cover with a lid and check from time to time. Beef has a lot of water in it so there will be a lot of steam and if you let it simmer in its own liquid, it will get pretty good. However the water tends to evaporate without a warning, from which point the meat starts frying and you don’t want that so watch it like a hawk. When you reach the point when there is no more water it is time to pour a cup of red wine (I used Merlot but any would do) along with a teaspoon of powder cumin. Put the lid on and let it simmer again until the wine is pretty much gone; now you can throw in your chopped veggies. The veggies I used are pretty basic though my mother would never have used red peppers and celery but I wanted to add a bit more flavor to my stew so I went creative. After you chopped everything as small as you can, place them in a skillet with a tablespoon of olive oil and cook until onions become translucent, usually 10-15 minutes on medium heat. After that is easy, pour them onto the meat you just finished cooking and get ready for the final stretch on your peas stew. Mix everything well together for a couple of minutes, then add water, a tablespoon of sugar and a small can (156ml) of tomato paste. Like any other stew, this one requires some garlic too but in this case I used tomato paste that already had it. Let it simmer for minutes then add the peas and carrots. I used frozen peas, about ⅔ from a bag of 760g but you could use the whole thing, depends of how much stew you want in the end. Add some more water to cover the peas and any other spices you can think of (I used some herbes de provence, pepper, mild chilli powder, salt); cook until the carrots are done. Add a generous amount of fresh dill and you are done. I wrote a freaking novel but don’t fret, it is easier than it looks on paper and infinitely more delicious than my pictures can show. Enjoy! Heat up a tablespoon of oil or butter in a deep skillet. 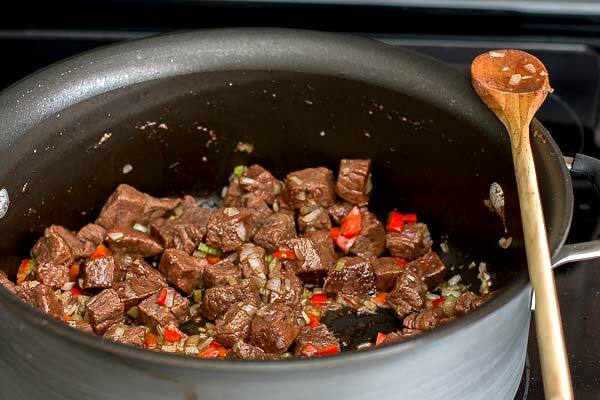 Cook the meat on medium-low heat until all the water from the beef is evaporated. Add a cup of red wine and a tsp of cumin; cook until all the liquid is pretty much gone 10-20 minutes; don't fry the meat though. Heat up a tablespoon of olive oil in a saute pan. 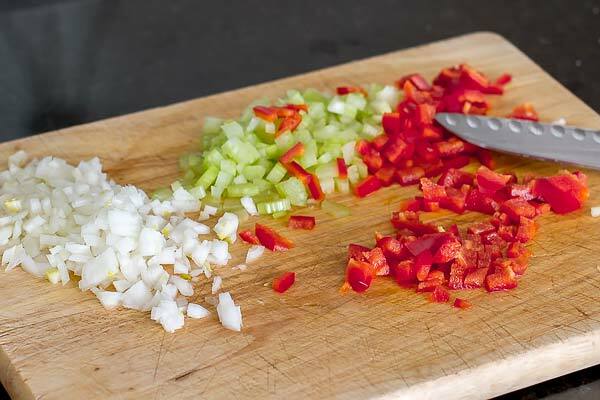 Add the chopped onion, celery, red peeper and cook until onion becomes translucent. Add the veggies to the meat skillet and mix for a bit; pour two cups of water, a tablespoon of sugar and the tomato paste and simmer for 10 minutes. Add peas, carrots and all the spices that you have left from the ingredients list; cook until carrots are done. Add fresh dill 2 min before removing from heat and enjoy. Leave a comment if I missed anything or you have any question. This looks soooo good! It’s definitely on my to-do list! HI! I just got this recipe from my mom and oddly, she uses paprika to make it red and vegeta (it’s like an Eastern European boullion), she never used dill. We were Romanians born in (the former Yugslavia), Serbia. Maybe that’s why? Looks a lot like yours though. Must try. Thanks you! You mention carrots toward the end of the recipe, but there are no carrots in the ingredients list…?